This is another 12 x 12 piece I submitted for the AWOL Gallery Show which is currently running in Toronto. 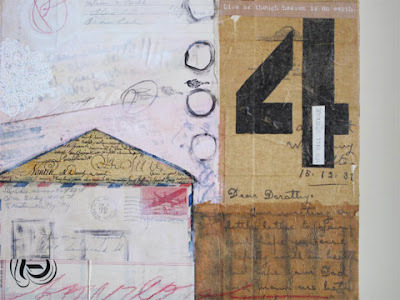 While the collection of vintage letters and envelopes was the original inspiration here, it was the number four that kept coming up for me as the layers of paper went down and mixed with the acrylic paint. The study of numbers - numerology - has taken on a spiritual and even mystical significance over the years, but it's the scientific spin that Greek philosopher and mathematician, Pythagoras added to his belief that numbers contained the secrets of the universe - that really inspires me. A special formula produces a specific number for each of us, and the Number Four person will chose a simple life as long as they can keep their imagination and friendships in tact. They are logical, sensible and hardworking to the point of making constant lists so they can be as efficient as possible in their daily routine. While very loyal, they try hard to control the people and situations around them. Does this sound like anyone you know?